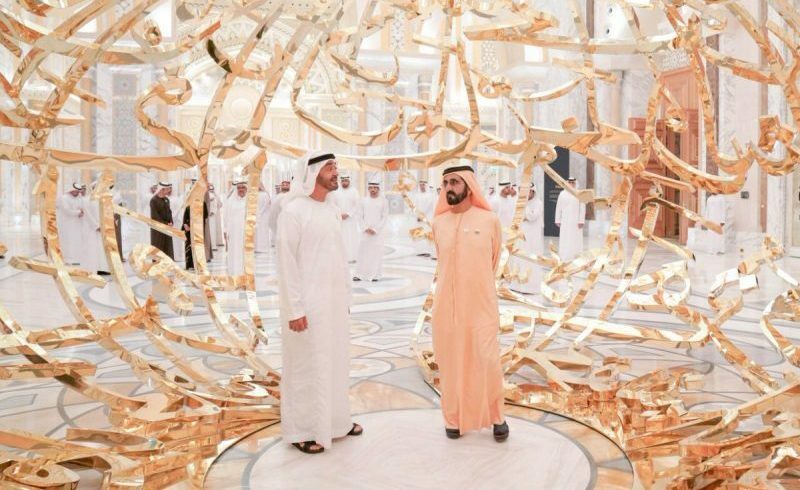 New pictures of Qasr Al Watan, a new monument inside Abu Dhabi’s presidential palace, which opens to the public on Monday, March 11, have now been revealed by the UAE’s leaders. The country’s Vice President and Prime Minister and Dubai’s ruler Sheikh Mohammed bin Rashid Al Maktoum released images of Qasr Al Watan, also known as Palace of the Nation, on Twitter. “Mohammed bin Zayed and I inaugurated Qasr Al Watan -Palace of the Nation- in the Presidential Palace compound in Abu Dhabi. The new cultural landmark reflects our heritage and identity, opening its doors to our people, residents and visitors,” he added. Abu Dhabi’s Crown Prince Sheikh Mohamed bin Zayed Al Nahyan also posted images on Twitter, saying the new monument stands for “cultural knowledge and communication between peoples of the world”. “The scientific, cultural and intellectual content of this palace is now open to the public”, he added. Qasr Al Watan will be open daily from 10am to 8pm. Tickets are priced between Dhs25- Dhs60 for adults. Evening visitors will be able to enjoy a light and sound show which will be projected onto the building, telling the story of Qasr Al Watan, and the vision the of the UAE. As well as the new attraction, the palace will house the Qasr Al Watan Library, which will hold a collection of books and resources about various aspects of the UAE’s history and growth. The artefacts and manuscripts will showcase the Arab world’s contribution to fields including science, arts, and literature.